BEST VALUE ON FRIPP!! LOTS OF BANG FOR YOUR BUCK! Motivated Seller! 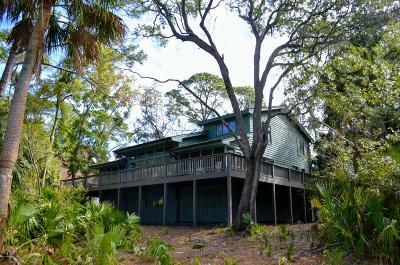 Located in the prestigious oceanfront community of Fripp Island, this stunning, custom-built, 4 bedroom, 2.5 bath home sits on a quiet cul-de-sac in the desired neighborhood of Fiddlers Trace. This campus also includes a separate garage/workshop with guest suite above that can be rented separately.As you enter this gracious open floor plan you are greeted with a wall of windows overlooking the natural wooded landscape. The spacious gourmet dine-in kitchen has custom cabinets with gleaming granite countertops, modern appliances, and a screened porch for outside gatherings.The roomy first floor master suite offers a walk-in closet, separate vanities, water closet, walk-in tiled shower, and private screened porch.